This year at the Bench Jewelers Conference the following seminars on Shop Management will be offered. A Practical Guide to Efficient Shop Management, ‘Run Your Shop Without It Running You’ offers jewelers useful advice to managing their shop. Take-In Procedures, Setting-Up a Shop, Pricing Repairs, and Productivity in the Shop are just a few of the subjects covered in this 154-page manual. eBench is a FREE monthly newsletter for Retail Jewelry Store Owners, Shop Managers, Bench Jewelers and anyone else that is interested. It contains numerous bench tips from master jewelers including; Alan Revere, Jurgen Maerz, Brad Simon, Charles Lewton-Brian, and others. Now in its 10th year of publication, eBench is the longest running publication of its kind in the jewelry industry and is by far the most popular. Has the Economy gotten you down? Do you need a Positive Shot in the Arm? The 2009 Bench Jewelers Conference may be Just What You Need! For the most part the Retail Jewelry Industry is a Recession Proof Business. However many Jewelers are failing to take advantage of everything at their disposal to help them through this economic downturn. Come to the Bench Jewelers Conference and learn what you need to know to thrive in your Business this year! Go to www.BenchConference.com and Register TODAY! May Be The Most Important Event You Have Ever Attended! Are you concerned about today’s economic effect on profits? Are you concerned about keeping your job in 2009? Are you looking for ways to make 2009 a better year than 2008? Register by March 20 for Early Registration Discounts! This may be the most Important Event you Attend in 2009. On The Bench and Proud of It! In sports, being On The Bench is something you want to avoid. However, in the Jewelry Industry, those on the bench provide job security and financial success during economic down turns. This in-depth seminar will look at the role of the Bench Jeweler in a down economy. You’ll learn to rise to the challenge of today’s difficult times and prepare for future prosperity. This seminar explores the business side of the bench. Setting up a Studio or expanding it takes capital planning. Learn how to add and pay for larger purchases of equipment - even in depressed times. Learn what you need, why you need it and most importantly how to pay for it. In this seminar Master Jeweler Chris Ploof will show you how you can have your Dream Studio. Proper time management is the key to shop efficiency. Learn how to get total control over the day-to-day operations of your shop, and increase productivity without sacrificing Quality. This presentation explores the effect that the physical environment has on productivity and how to identify and eliminate time wasters that keep us from getting our work done. Learn how to maximize profits in the shop by setting correct prices. You’ll learn the three essential ingredients to setting prices, and how these affect the price you can charge, as well as several myths to pricing your services to avoid. Learn how to set prices that your customers are willing to pay and will maximize profits in the shop. The past few months have been some of the most profitable for Master Laser Welder Scott Isaacs and this seminar will show you why. Laser Welding has transformed his shop allowing him to be more productive and more profitable. This seminar will show you how to get more work done in less time, perform better work, and improve overall shop efficiency. If you have ever tried to photograph jewelry, you know how challenging it can be. This two-part seminar will show you how to take close-up pictures of your jewelry, eliminate glare, bring out the details of the piece, and show off your jewelry in the best possible manner. You’ll also learn how to enhance your picture with color correction, re-sizing, sharpening the image, and much more using the most popular digital photo software available. 2008 - What a Year for Jewelers! The Price of Platinum Skyrockets to Record Levels ... Then Plummets! Gold breaks the $1,000 an Ounce Barrier! A Deep Recession Hits - Resulting in the Worst Christmas Season Jewelers can Remember! 2009 can be the Most Profitable Year for Bench Jewelers ever, if - And Only IF - They have their prices for Jewelry Repairs and Custom Work Set Correctly! In Spite of the Current Economy and Unstable Precious Metal Prices you can be Profitable if you Know How To Correctly Set Your Prices for your Jewelry Repair, Stonesetting, and Custom Design Services. From Fee to Shining Fee is a computer software that allows you to get a better grasp on your true cost and a tool to help you set your prices correctly. Fee to Shining Fee is a Microsoft Excel Spreadsheet Template - You MUST Have Microsoft Excel to use it. "I have been using the Fee To Shining Fee Software and think it is the best tool ever created for setting prices in the jewelry repair shop. I really like the organization and comprehensive format. I tell everyone in the business I talk to about this software. Thanks for all your hard work in putting this software together. Your help is greatly appreciated." All you have to do is type in your cost of labor, the precious metal prices, and the mark-ups you want and the software does the rest creating a custom price list with over 200 Repair, Stonesetting, and Custom Design Prices JUST FOR YOU. Plus it is completely customizable to generate your price list just the way you want it. NOW For a Limited Time you can download this software along with a user manual for Absolutely No Cost To You, when you sign-up for the Bench Jewelers Network. Plus we are so sure that once you see all that is available on this network we are giving you your first month FREE! To take advantage of this Incredible Offer you must enter a valid credit card. You will be billed $24 a month for each month after you first month. The Bench Jewelers Network is an Online Community of Professional Bench Jewelers, Students, and Serious Hobbyist. Here you can learn all about Jewelry Repair, Stone Setting, Jewelry Fabrication & Casting, Shop Management, and Much More. Our vast Resource Library Contains Articles and Videos on everything related to Bench Jewelers. Plus you can ask questions, share tips & tricks, and show off your latest creations in our Members Only Forum. Becoming a Member could very well be Your Key to Success in 2009! P.S. 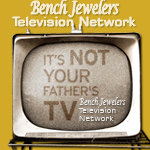 You can cancel your membership to the Bench Jewelers Network at any time, but once you see all the information in the resource section and join in the discussions you won’t want to. P. P. S. Even if you do cancel your membership to the Bench Jewelers Network you get to keep Fee to Shining Fee! P. P. P. S. If you want to save even more money you can join the Bench Jewelers Network for ONLY $197 a year instead of the $24 monthly charges. MJSA’s annual Expo will be held in New York April 10-15, 2008 at the Jacob K. Javits Convention Center. MJSA Expo New York is the largest and oldest trade show in the United States dedicated to the design and manufacturing of jewelry. The show features nearly 400 exhibits of some of the latest and most innovative tools, supplies, machinery, components, services, and finished products all under one roof. MJSA Expo New York also features a full roster of educational seminars by some of the industry’s most renowned experts, and a cocktail party where our exhibitors and attendees can network with colleagues from all around the world. Platinum = Profits! Learn how to take full advantage of The Platinum Opportunity in this unique seminar from the Platinum Guild International. The high price of platinum today makes it more important than ever to know how to inform your customers about all the advantages of platinum jewelry. The future is poised for tremendous opportunity to grow your platinum business. Platinum Guild International is here to help you tap into the power of the platinum brand and to build an even more profitable business.